Adam Revelette of Examiner.com provides an in-depth breakdown of the road to the Southeastern Conference tournament the University of Kentucky faces. If you didn’t catch it on the BluGrass Baseball Twitter over the weekend, you have to see this video of Western Kentucky University‘s rain-delay entertainment during its series at Florida Atlantic. 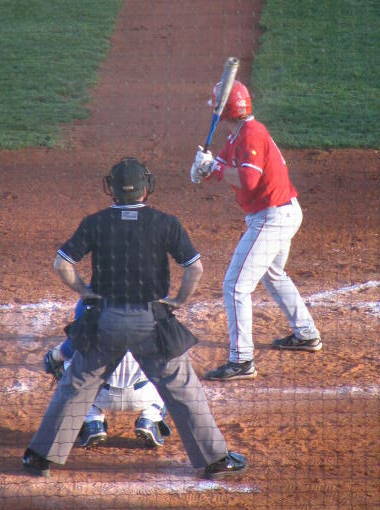 Nick Baumgardner of the Bowling Green Daily News reports WKU second baseman Matt Payton is doubtful for the mid-week showdown with UK after suffering an oblique strain during batting practice Friday. Payton missed the weekend series at Florida Atlantic. Aaron Fitt of Baseball America profiles PRP alum Zack Cox in the weekly Golden Spikes award spotlight. Morehead State University senior shortstop Drew Lee was named the Ohio Valley Conference player of the week. We reported UK coach Gary Henderson‘s decision to not name a permanent Sunday starter while Alex Meyer is out with mono after Sunday’s game via Twitter, but Aaron Smith of the Kentucky Kernel delves further into the situation today. The University of Louisville stayed at No. 13 in the latest Baseball America top 25, and WKU fell out of the rankings. UofL stayed at No. 11 and WKU dropped out of the latest Rivals.com and Yahoo! Sports top 25.